As the 2015 Best In The Desert season is now in full swing, the largest state side race of the year, The Mint 400, is taking over Las Vegas, Nevada all week for what is now becoming a race comparable in size to some of the greatest motorsports events in the country. This race will be the second race of the year for Jim Beaver and the #15 General Tire/Down & Dirty Radio Show Trick Truck. A brutal race to start the season at the Parker 425 race would see Jim Beaver passing 23 cars on the first lap after starting near the rear of the field due to mechanical problems in qualifying. The good fortune would come to end end with a Class 1 car stopping on the course that Beaver would collide with, causing the #15 Trick Truck to roll at speed several times. Since Parker and the roll, the team has been working in the shop endless nights and days to prepare the truck for The Mint 400. "Parker is one of those events you just want to forget about. The truck was fast, but after the roll we were left with a lot of damage. My crew and their dedication is why we are able to make it to this race," stated Beaver. "They deserve all the credit and are the reason why we are racing at the Mint 400." The Mint 400 and its owners, Mad Media, are striving to make this race not just one for racers, but one for the fans too. Events will start on Wednesday with the historic race vehicle parade down Las Vegas BLVD (The Strip) that will lead into the opening party for the week. Jim Beaver once again will be pulling double duty as he will not only be driving and participating in the scheduled events as a driver, but he will also be hosting the downtown festivities on Fremont Street on Thursday night. After Thursday mornings qualifying, teams and fans can make their way to downtown Las Vegas, where The Mint 400 will be taking over Fremont street. The 2015 Miss Mint will be crowned, KMC Wheels Pit Crew Challenge will take place, and Time Trial awards will be presented. 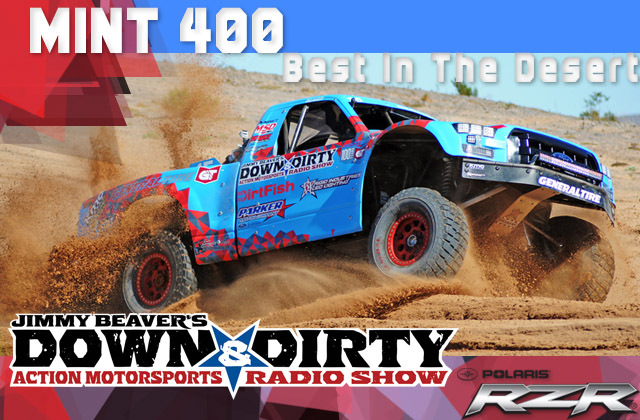 Friday during contingency, Jim Beaver and his co-host, professional female motocross racer and media personality Ami Houde, will air the Down and Dirty Radio Show Powered by Polaris RZR live from the Polaris RZR compound on Fremont Street. You can listen in live from 12:00-2:30 Pacific and even stop by the Polaris booth to listen in person as they interview some of the biggest drivers and personalities in off-road racing. Houde, no stranger to the Down & Dirty Radio Show, has a reoccurring weekly segment on the show every Monday and she is also a 2015 Miss Mint 400 finalist who will be competing for the crown on Thursday night. You can also catch Jim Beaver from 3:00-4:00 Friday at the KMC Wheels booth, where he will be signing autographs to wrap up Fridays events. Race day will start before sunrise, and Beaver will once again be pulling double duty by doing commentary during the morning race for the online live-stream as well as live audience at the event. Following the mornings early race, Beaver will be suiting up to get behind the wheel of the #15 Trick Truck to race this years brutal Mint 400. The premier Trick Truck class, with it's 50 plus entries, will be racing in the afternoon race and will race into the night, where the #15 has a distinct advantage being outfitted with the latest in LED lighting technology from Rigid Industries. This race is known for seeing leaders change numerous times throughout the 3 lap race and finishing is never guaranteed. The 2015 Mint 400 is guaranteed to be one for the record books. 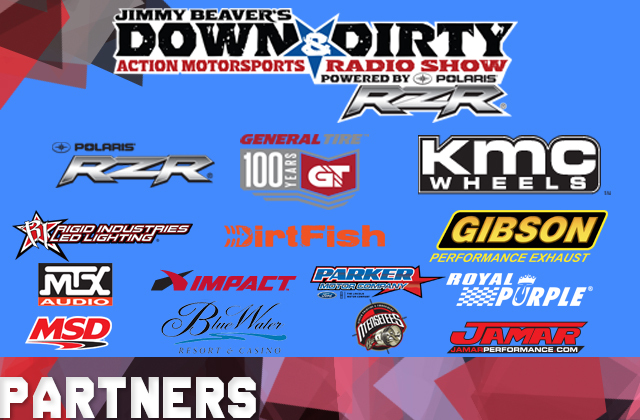 Be sure to follow Jim Beaver on Facebook, Twitter and Instagram @JimBeaver15 and also tune into the Down & Dirty Radio Show Powered By Polaris RZR every Monday to hear all the latest news in off-road and action motorsports.